In the last week of October, I decided to check out the north side of the Glenmore Reservoir. I’d explored the west side a few times (the Weaselhead Flats) and I’d walked along the eastern shore one evening to see the sun set behind the Rocky Mountains. Down the bluff from the paved walking and cycling trails, there is a narrow, pebbly, dirt path that follows the shore of the reservoir. I headed west on this trail, stopping often to watch and photograph the Buffleheads and Common Goldeneyes floating, diving, preening and playing on the water. One of the perks of staying still for 10 minutes while taking pictures is that birds or mammals will often appear nearby for a brief bout of foraging. 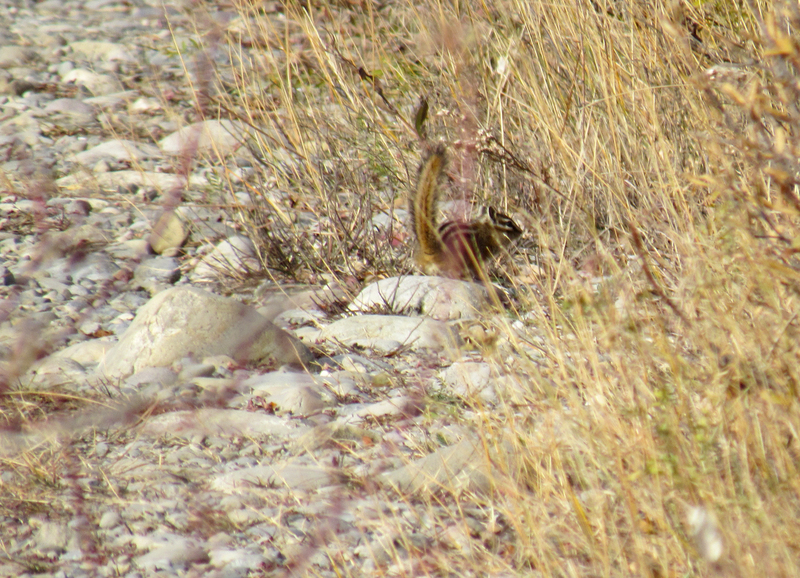 As I was duck watching, I heard some rustling in the shrubbery and I met my first Calgarian Least Chipmunk. 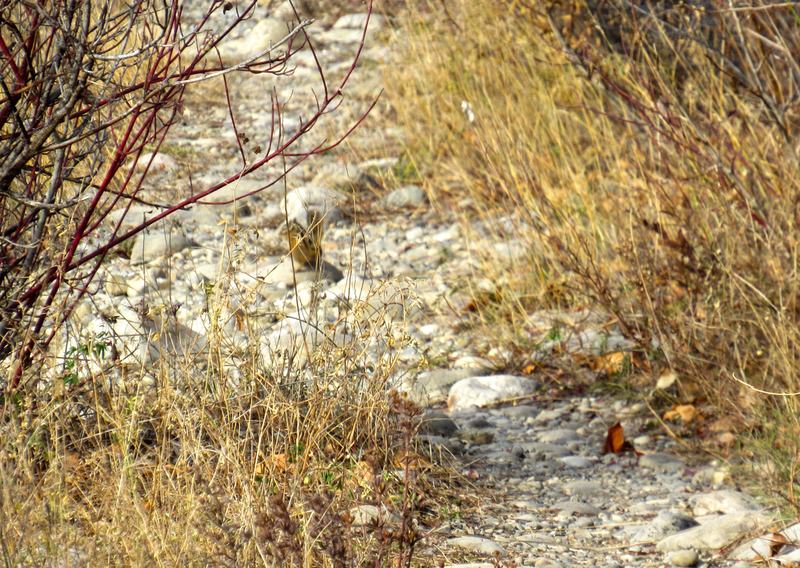 My attention left the ducks and I enjoyed some chipmunk cuteness. Oh! Their little sounds… and the way they move. Cute! I met a few Chippies this way. 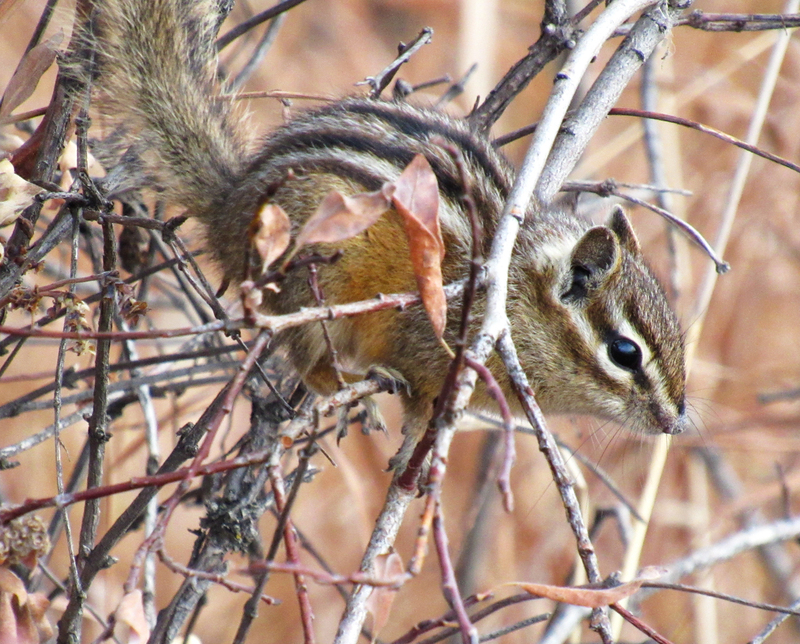 I used to think chipmunks were cute until they ate all our blueberries (or pulled off unripe ones and not eat them). 😀 Well, I still think they’re cute, but I also think they’re evil now, too. LOL! I love the new look of your blog! But now it won’t let me read it in my Reader and pulls up a new tab. Sounds like you need to up your blueberry security with a chipmunk alarm :-D! Forest creatures are cute but they are fierce food competitors sometimes. I changed my WordPress blog settings so now people can’t read a full post in the Reader. I would have done it only for the posts which have picture galleries (they don’t work well in the Reader) but it is an all or nothing setting. So does “picture gallery” mean having more than one photo? I have seen other posts that have a bunch of photos that still use the Reader option. I didn’t even know you could choose a setting that doesn’t let you read it in Reader! I’m feeling like my parents asking how to program the VCR…LOL! By “picture gallery” I mean when I put all the photographs in one post in a gallery. So they show up as a rectangle of tiled images (there are a few other tiling options too… I did circles for gulls once). When viewed in a WordPress website, clicking on one of the images shows the images in slideshow format and the full image caption appears below each slideshow photograph (the caption can be many sentences long). In the Reader, the tiled photographs show up, but when the viewer clicks on one of the photos, a web page opens with just that photo, not a slideshow. At least, that is how my web-browsing experience goes. It may be different for other people. I used a “picture gallery” for my vole post last week and I didn’t want people to have that wretched “one photo web page” experience. It took me a little WP admin surfing to figure it out. I knew it was possible because Circadian Reflections and W.H. Sim do it with their posts. Made by Mitza doesn’t force viewers to see her gallery photos on her website. So if she posts a gallery, I click the extra click to see it on her website. Did that make any sense? Oh yay! I made sense. I’m touched that I am worthy of precious bandwidth :-). My internet was crawling the other night. I think it was some Malware that was soon detected and discarded. But man did it drive me nuts! 30 seconds to open a webpage!!! Welcome to my (slow) internet world. 😉 I’m glad the malware was detected and taken care of! Forgot to add that I love your photos of them! Thanks Haunani :-)! Happy to share some chipmunk cuteness! Ha! Chipmunk cuteness~ I like that. Your photo is fabulous! Thanks Melissa :-)! The chipmunks were being quite fabulous! Thanks Monica :-)! I’m glad I got a few sneak peeks. They are such little cuties, but boy, do they bedevil my dog! :-). How do chipmunks bedevil your dog? New people just moved into the house behind mine. They have a dog and two cats who hang out on the back porch. The magpies love teasing the dog! Though I think the dog is getting used to them now… he’s getting less reactive… so the teasing games will likely dwindle away. Funny about the magpie. I’ve seen videos of them teasing animals. Clever tricksters!